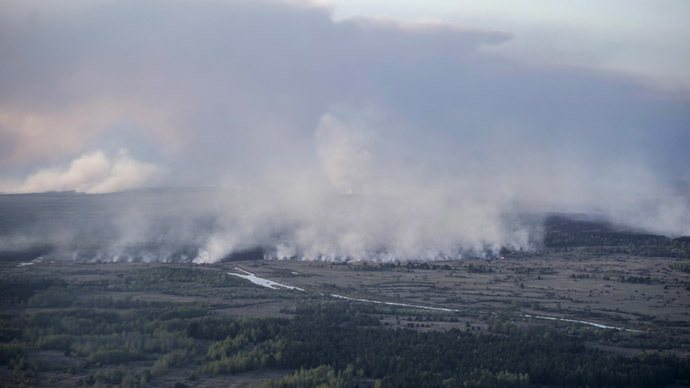 ​The forest fires in the Chernobyl exclusion zone may re-disperse a significant amount of original radiation contamination, depending on whether the fire continues in its trajectory toward the epicenter, evolutionary biologist Timothy Mousseau told RT. RT:How dangerous is the situation right now? Timothy Mousseau: Well, from what I can tell, and there hasn't been a lot of detailed information available, but based on the satellite image that I've seen and an area on the map, the Chernobyl map that has been outlined for me by people who are working in the town of Chernobyl right now – they’ve suggested it is to the south of the main contaminated area and heading north. And if you look at the satellite image you can see that the clouds, the smoke is heading directly towards Minsk, Belarus. And I suppose that is good news for Ukraine, but bad news for Belarus. RT:And how worried should Belarus be then? TM: Clearly you would not want to be downwind in the main plume. I think the greatest hazard of course is for the firefighters who have to go in and who are going to be forced to actually breathe this contaminated air. But as I've mentioned earlier, this smoke is heavily contaminated. And it is likely to get more contaminated if this fire continues in its northward trajectory. RT:Due to a lack of funds, plans to replace the sarcophagus were suspended while the radiation was dangerous in the area. How could these plans could have been put on a back burner then? TM: As you say, this is clearly a question of funding. This new Safe Confinement Facility is enormously expensive and more expensive every year. Without money they haven’t been able to finish it. Hopefully this meeting in London this week will address that issue. RT:And do you think they should? You think this is international, the EU’s responsibility to help fund this? TM: Well certainly, it is not my place to say who should be paying for it, but it is clearly an international, a global issue that needs to be addressed and this whole area needs to be cleaned up. It is not just the old reactor but the surrounding area as well. As we see with this fire burning, one of the problems is that this area is highly contaminated and it is staying highly contaminated and will be for quite some time. RT:What does that actually mean in reality? What is the worst case scenario of what could happen here? TM: The simulations that our group undertook last year indicated that previous forest fires in the area had re-released, re-dispersed about eight percent of the radiation from the original catastrophe. Certainly the fire that we’re seeing today seems to be on a much larger scale. So we could see a re-dispersion of a very significant component of the original radiation. Again, depending on which way the wind blows, which way the fire goes. Whether it gets to the most contaminated parts of the zone, the so-called Red Forest area near the actual reactor.